New Worksheets - Author Mary Stewart has developed worksheets for each chapter that are designed to improve student comprehension and increase engagement. Each includes at least one section in which students must apply knowledge gained from the reading to their own artwork. A distinctive Part Four, on 4D or time-based design, highlights this area of growing interest, with examples from film, installation, and computer art. "Key Questions" appear throughout the text (immediately following the relevant topics), probing students on key concepts and helping to reinforce and apply the material. Provides a lively and concise introduction to the theory and practice of visual communication. Presents a practical discussion of the materials available for 3-D design. 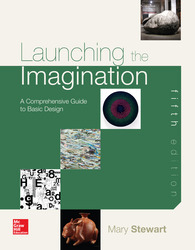 A Wealth of Art and Design Examples - More than 80% of Launching the Imagination's 600 illustrations are presented in full color. Expands Online Learning Center to include the material formerly on the Core Concepts CD in MyArtStudio plus features chapter objectives, overview and related readings, flashcards, Internet exercises, key terms and student quizzing. Clear and concise key questions at end of each major section of text.